Hairy Mountain Folk: Bianca Makes Fetta!! Bianca has been planning this for a couple of weeks now but she has finally done it. 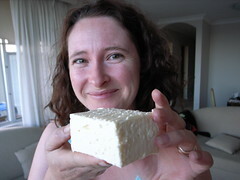 She has made cheese! No not between toes but real life cheese! Fetta to be exact. I just had some on some crackers and it was divine. It was achieved with great help from James...thanks James! Oh my god you giant hippy. Nice work though, I tried to make Skordalia from the scratch recently (with my new blender) and upped the garlic as 4 cloves didn't seem sufficient. It was inedible. Keep at it, mountain kids.